In SSAS when you create a calculated measure and assign a some folder to it, It seems good when you have assign no translation to it. The calculated measure will be under the same folder. But when you assign some translation to the calculated measure it will come out of that folder. It will appear in the root folder. Problem: Let’s say you have created a calculated measure in SSAS (ABC) in SSAS and assign it some translation (XYZ) in some other language. Now assign some translation to this calculated measure. 2. Choose you language in which you wish to provide the name to this calculated measure. 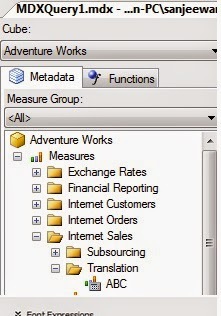 Save your cube and process it , Now you will see when you browse your cube in specified language the calculated measure will be out of translation folder because while providing other language name to calculated measure there is no option to provide folder name in translation Tab. In this example I have used English name of the calculated measure as ABC and Translated Measure Name XYZ in Japanese language. 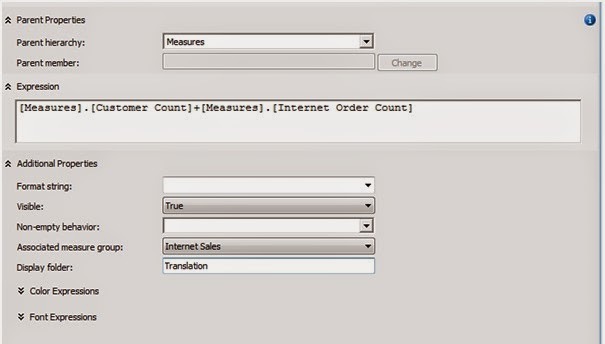 While browsing in Japanese language the measure name should be XYZ and it should be in Translation folder under Internet sale measure group but it will be out of translation folder you can see in below pic. Please note: This is risky process be careful while doing this process there should be no alteration in other code while doing it. I would suggest it should be done by some experience guy.